ATH-LDN - 16-29 April 2007 - Showcasing some of the most innovative musicians, sound artists, producers, performers and DJs working in Greece today. A. communication saturation/non-linear optico-sonics. The Erasers will be producing & editing images in real time. This process of instantaneous image development is based on audience interaction & is both site- and time-specific. The Erasers use technology as a means of immediate communication: their cameras are devices for immediate optical dialogue. B. live art/live sonic manipulation/performance/spontaneous action. 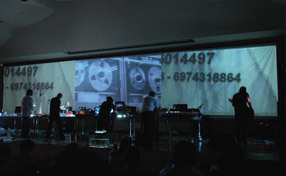 In this transmission, The Erasers will be using a xerox machine/ a crash surface/ a hidden performance room and their own invented sonic devices which are also manipulated in real time. The Erasers make use of techniques such as displacement, paradox, plagiarism, resistance through provocation, rumours, sabotage and hoaxes in order to manipulate & overturn the archetypes of history as well as the experience of popular culture. Their audio-visual performances explore different possibilities of escaping conventional identities and provoke members of the audience in taking part in erasing aspects of culture & history. Formed in 2005, they have presented work at Video Dance, Lifestyle Death, Benaki Musem as part of Synch Festival, Vinyl Microstore, Athens Video Art Festival & Deste Foundation. 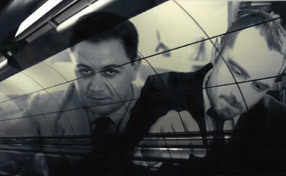 The music of the unsurpassed composer Manos Hatjidakis got a contemporary make-over through the electronic forms of K.BHTA, who covered come of the most important compositions of the genius artist in his album. These unique covers are accompanied by powerful video works & animations directed by Giorgos Theonas. Transformations is a provoking audio-visual performance that aims to compose contemporary landscapes of human existence, based on K.BHTA's readings of Hatjidakis's works. Transformations was produced by Stefi Productions & has already been shown at Benaki Museum as part of Synch Festival, Athens. K.BHTA is an electronic music producer based in Greece. Back in the 90s he formed the electronic band Stereo Nova with Michael Delta and as a solo artist, he has produced numerous albums to critical acclaim. He has extensively collaborated with other musicians, visual and media artists and has presented work internationally.